San Juan, Puerto Rico was the destination for this year’s summer workshop and the last activity of the Program for Narrative and Documentary Practice, which is now concluding its eight years of educating visual journalists and storytellers at Tufts. Four recent graduates and four rising seniors participated in the workshop, all with a different story and approach to the workshop. For many, this was the first time they had done anything like this. With only one week to produce a compelling visual story on a topic they had previously researched, the task was daunting and nerve-wracking for many, but exciting for all. The purpose of the workshop was for students to learn how to tell an important story given very demanding time constraints. Hurricane Maria’s impact on the island was the focus of many stories and one of the main reasons for choosing Puerto Rico. Documenting these issues not only raises awareness of the impact of Hurricane Maria but it also helps to educate others about the ongoing impact of last year’s hurricane season. Most of the students had never been to Puerto Rico before, and many did not speak Spanish. 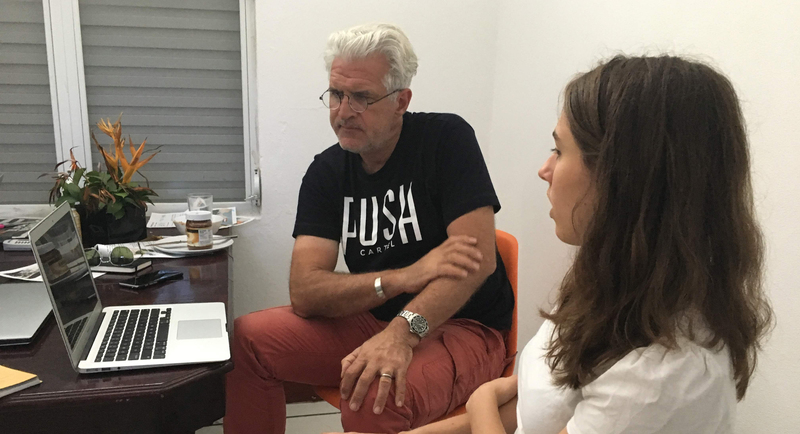 Under the guidance of PNDP Director Gary Knight, we were encouraged to break out of our comfort zones to do reporting that depicted a more complex narrative of Puerto Rico’s recovery efforts than other media outlets have portrayed. Understanding our identity as visitors from a university on the main land was crucial, especially in gaining trust from Puerto Rican citizens and accurately representing Puerto Rican daily life. One of our main goals was to uncover the more covert impacts of the hurricanes on deeply engrained ways of life on the island. One student discussed how accessible the city of San Juan is to people with disabilities, commenting on differences pre- and post-Hurricane Maria. Another produced a short documentary with a student from the University of Puerto Rico on the ways a family-owned, small business has been impacted by the devastation to the economy; yet another documented youth culture in San Juan, paying particular attention to what reasons many have for staying on the island when many friends and family members have chosen to migrate to the main land. Two students travelled outside of the city to visit towns that have more visible impacts from the storm, one documenting the different energy and electricity resources people have, such as solar panels or back-up generators. Another student went to different parts of the island to interview and photograph families of public schools that are facing a wave of school closings by the Department of Education. Daily critique sessions with Gary helped us learn how to improve our photography and reporting skills. These sessions were extremely useful throughout the week, and we came out of the workshop having improved our skills. We also gained an appreciation for Puerto Rico. It is a very complex place with a lot of rich stories, activism, history, and people. We hope our stories serve as one step in a process of learning about the beauty and challenges in Puerto Rico today.